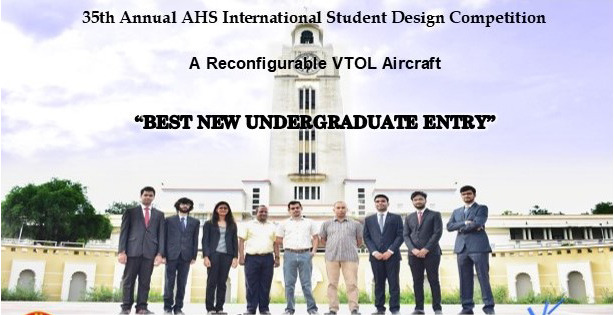 BITS Pilani Student Team wins 'Best New Undergraduate Entry' at American Helicopter Society 35th International SDC 2018. The Vertical Flight Society's annual Student Design Competition challenges students to design a vertical lift aircraft that meets specified requirements, provides a practical exercise for engineering students at colleges and universities around the world and promotes student interest in vertical flight technology. This year the competition was sponsored by U.S. Army Research Lab. This the first time any BITSian team has participated in the competition and the only Indian team to win this competition since 2011 in the undergraduate category. Team Garuda comprised of six then third-year undergraduate members and was mentored by Prof. M.S. Dasgupta. Every year a problem statement is released and each participating team needs to design a VTOL(Vertical take-off and landing vehicle) as per a given problem statement in the given constraints and according to the judging parameters. Team Garuda designed Druta, a reconfigurable VTOL with variable diameter coaxial tiltrotor and spanwise adaptive wings. The team has been awarded $500 as prize money.